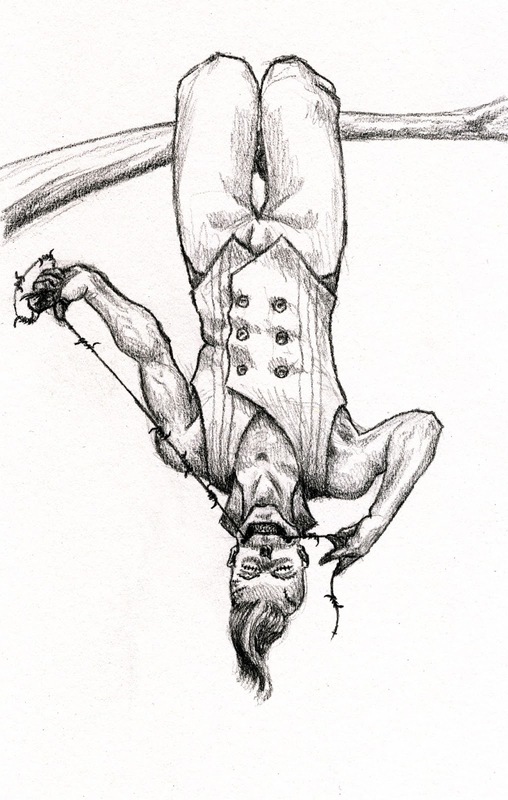 In a tarot deck, one may often find the Hanged Man on a tree upside down, one leg crossed over the other. The readers of the cards will tell any number of interpretations of divinity, suspension of life, martyrdom, but none will speak of the true meaning of the card. The card represents the Hanging Men, those who are between sleep and waking, on the edge of life and death. The Hanging Men are the ghosts of men who died destitute and shamed for their cruel actions in life, and they hang from unseen trees. All of the Hanging Men appear to have been at least partially flayed, their bodies less the pound of flesh they paid for their sins. Hanging Men can only be seen in peripheral vision, on the brink of death, or in dreaming sleep. They will target a person based on some imagined slight, still bitter and vindictive from their past life, and tease them, creeping into their minds and burning in thoughts of self-hatred, visions of pain and horrific torture, and leave the person with a damaged psyche as their revenge. A victim may never escape the Hanging Men. If they are fortunate, they may find a blessing that hides them from the view of these spectres, and if they are less fortunate, they may meet someone in their dreams who will offer them a way out. In either case, by the time an option is found to leave, most people will take whatever option they can to get away from the endless scenes of terror that play in their minds.